With summer movie flicks on their way to us, I wanted to review some of the great, iconic movies of all time and the watches that we saw in those films. It is a topic I wrote extensively about in other posts, so it is worth taking a look at once again now. Especially since we have seen Captain Marvel in a Citizen, Urwerk in Spider-Man and so much more. Instead of the current movies, though, we take a look at the iconic movies filmmaking, including James Bond (whose 007 role couldn’t be played properly without gadgets, gizmos, and the perfect watch), LeMans and more. 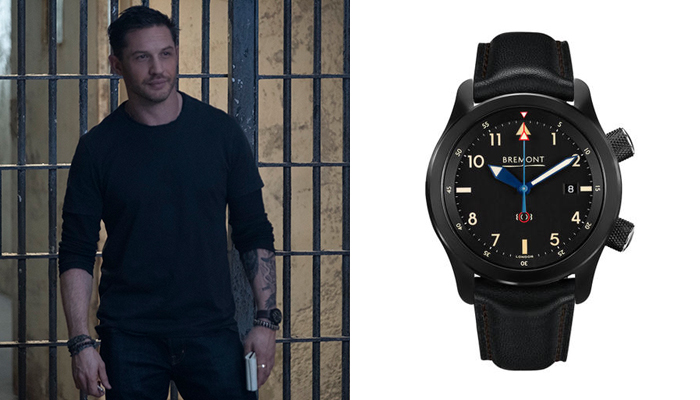 In short, here, we take a look at 10 watches that played starring roles in top films. 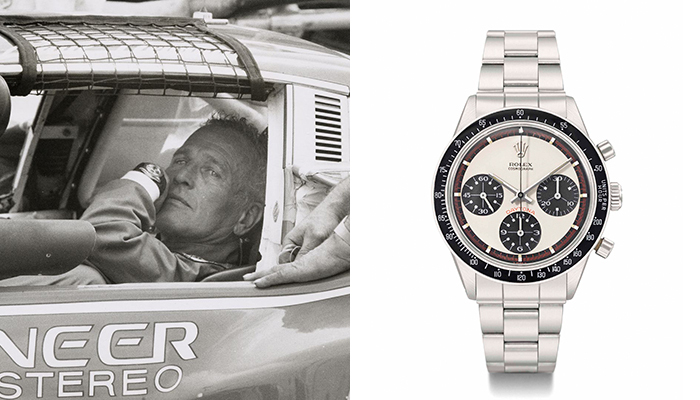 “When Paul Newman was filming the 1969 race car film, Winning, he was gifted a Rolex Cosmograph Daytona watch by his wife Joanne Woodward. It had the words “Drive carefully — Me” engraved on the case back and Newman wore it faithfully for 15 years. 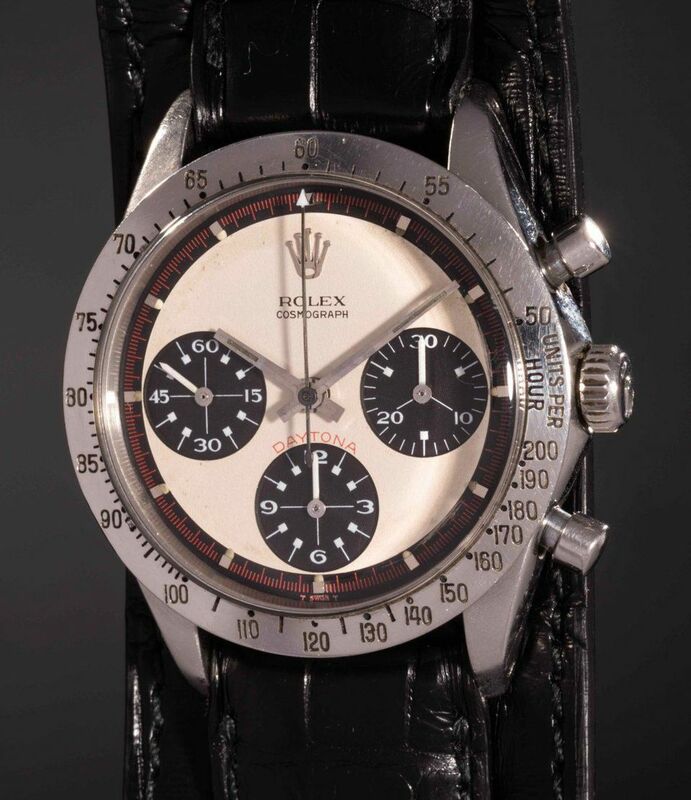 Newman created a craze among watch collectors who had to have the “Paul Newman” Rolex. His original watch was auctioned a couple of years ago for more than $17.752 million. Paul Newman also wore a Rolex Datejust in the 1986 film, The Color of Money. The Rolex GMT Master watch has had some grand (if not dubious) roles on the big screen. 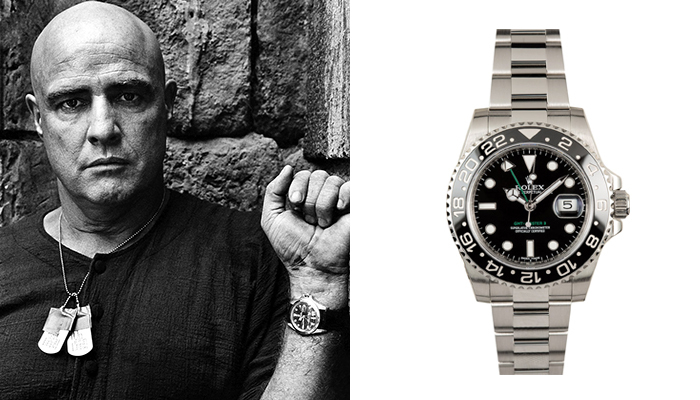 In the famed 1979 movie, Apocalypse Now, Marlon Brando (who played Colonel Kurtz, the rogue solider turned cult leader during the Vietnam War) wore a Rolex GMT Master. He wore a steel version with a leather strap but without the rotating bezel. Interestingly enough, this was the same watch of choice by Dennis Hopper in the 1994 movie Speed, where Hopper holds passengers on a bus hostage remotely while forcing a young police officer to keep the bus driving at above 50 mph or a bomb on board would explode. Hopper wore the Rolex GMT with metal bracelet and a blue and red “Pepsi” bezel. 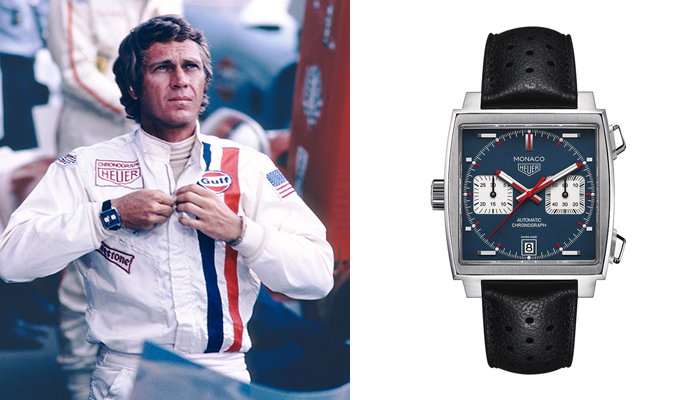 The original King of Cool, Steve McQueen, wore a Swiss Heuer Monaco watch in the 1970 movie, Le Mans. (Back then, the brand was simply Heuer, not yet TAG Heuer). McQueen’s watch featured a squared blue dial. That watch sold for approximately $800,000 at auction in 2012. The rebel racer and beloved actor also wore a Heuer crest on his racing suit in the movie. James Bond (aka 007) has had a long relationship with Omega, ever since Pierce Brosnan wore one in GoldenEye (1995). The brand also worked with Daniel Craig, the current Bond actor, for its newest campaign featuring the Omega Seamaster Diver 300M collection. The newest evolution of the Seamaster Diver 300M has been revamped, with a new helium escape valve and materials that make it anti-magnetic up to 15,000 gauss—which is hopefully enough for Bond. 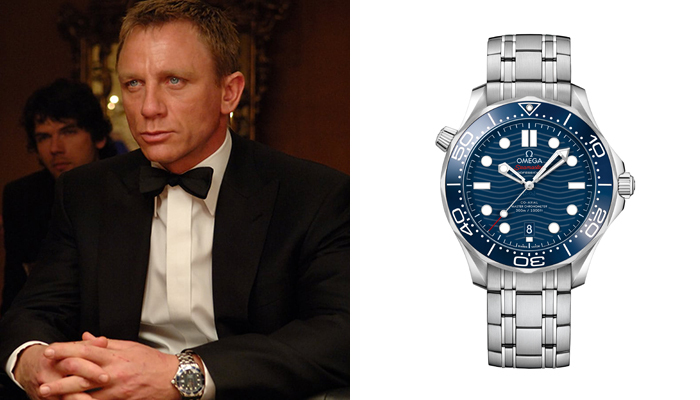 Daniel Craig wears Omega in each of his roles as Bond, including in Spectre. The Omega Speedmaster watch was the only mechanical watch certified by NASA for space flight in the Apollo missions in 1965. For the ill-fated Apollo 13 mission, it was an Omega watch that helped the astronauts time their re-entry to Earth’s atmosphere inside the small capsule. 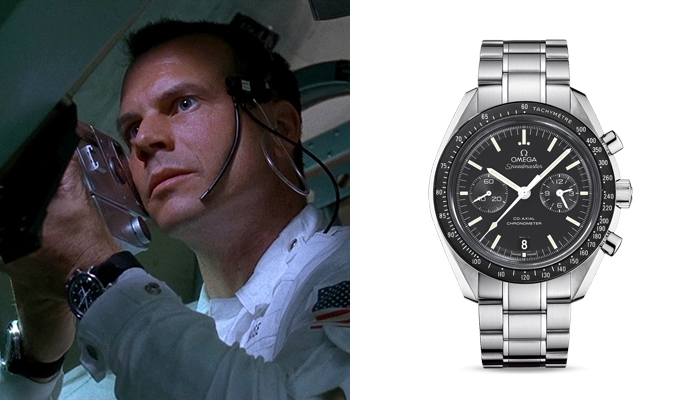 As such, in the film adaptation, Apollo 13 starring Tom Hanks, the actors all wore the Omega Speedmaster watches to accurately portray the historic event. There really was no other watch to be shown. 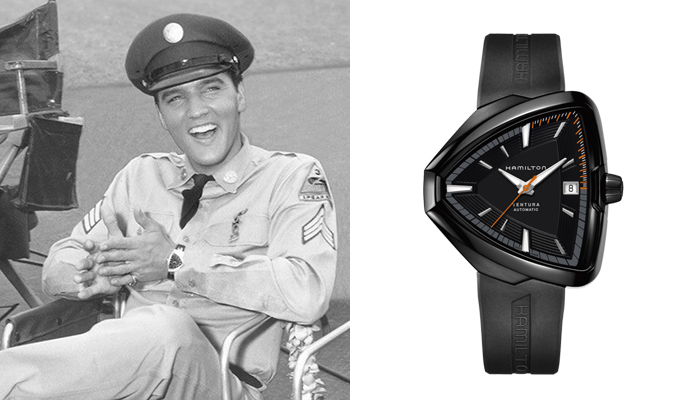 The triangular-shaped Hamilton Ventura watch has played a starring role in a host of movies, not the least of which was worn on the wrist of Elvis Presley in the famed movie Blue Hawaii. Elvis loved the Ventura and owned and wore it off the set as well as on the set. Years later, Will Smith wore a Ventura in the Men in Black (1997) movie. Both the Khaki Field and the Khaki Pilot watches have seen the big screen multiple times. 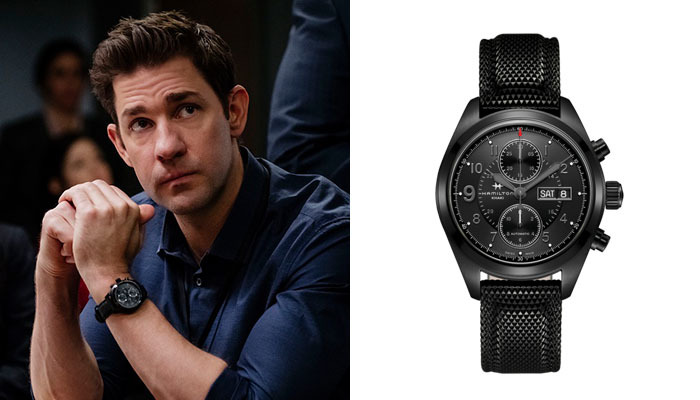 Actor John Krasinski, playing author Tom Clancy’s character Jack Ryan, wears the Khaki Field Auto Chrono in stealth black in the movie and series. Similarly, Matt Damon wore a Khaki Navy Belowzero watch in The Martian and Matthew McConaughey wore a Khaki Pilot Day Date in Intersteller. 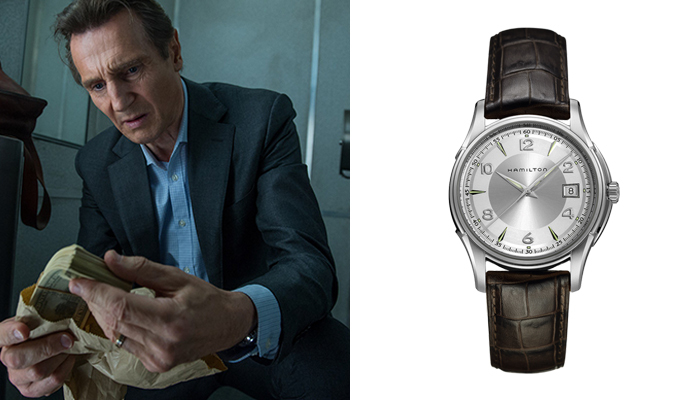 In The Commuter, released last year, Liam Neeson wears a Hamilton Jazzmaster watch. In fact, Hamilton has had along association with Hollywood, dating back to the 1950s when it had a starring role in the movie Frog Men. Since then it has been seen in more than 450 movies. For 2001: A Space Odyssey, the brand designed a special timepiece and table clock. Robert Downey Jr. specifically requested that Urwerk grace his wrist in his role as Tony Stark/Ironman in Spider-Man Homecoming. The 18-karat watch later sold at auction for a cool $150,000, with proceeds going to charity. 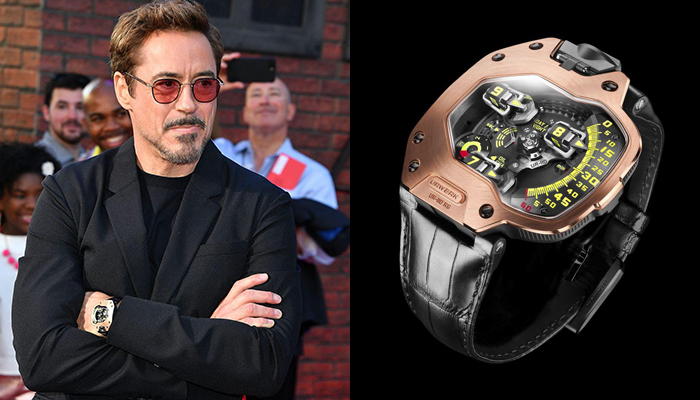 In the movie, Robert Downey Jr.’s character used the watch as one of Ironman’s gadgets; in turn, Downey Jr. asked that the watch be made in the colors of Iron Man, black titanium and 18-karat rose gold with yellow numerals.